There’s no denying it (though I’m trying! ), Thanksgiving is a week from tomorrow! I am about as unprepared as I’ve ever been. 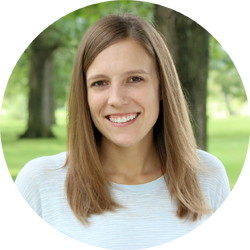 Both my husband and I have been dealing with a couple different sicknesses the last few weeks that have left both of us with little desire to eat let alone think about preparing a large dinner. However, I can’t put it off much longer! I figure that I’m not the only one who hasn’t been able to plan for the big day like they wanted, so I’m sharing a few quick and easy Thanksgiving recipes in the next few days that can be made at the last minute but still taste great! The first of these easy recipes is cheesy scalloped sweet potatoes. 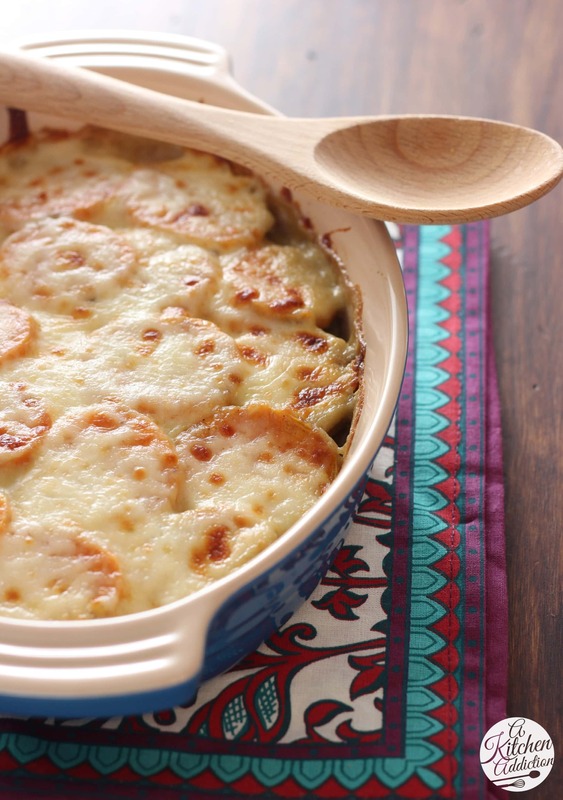 Cheesy potatoes are a must at Thanksgiving! It just isn’t the same without them, and doesn’t get much easier or tastier than these potatoes! Instead of your typical scalloped potatoes, I’ve switched them up with sweet potatoes and a hint of nutmeg. Combined with a creamy sauce and gooey cheese, these cheesy scalloped sweet potatoes will become the star of the dinner! All you need to do is mix together the sauce and slice some sweet potatoes. Layer the two in a dish and bake. When it’s almost done, sprinkle with cheese and bake or broil until cheese is brown and bubbly. See? I told you it was easy! You now have one less side dish that you have to worry about for the big meal! Preheat oven to 375. Lightly spray a 2 qt baking dish with non-stick cooking spray. In a small bowl, whisk together milk, garlic powder, thyme, salt, pepper, and nutmeg. Place a layer of sweet potato in the bottom of the dish. Pour a scant ¼ cup of milk over the top. Repeat with remaining sweet potatoes and milk mixture, ending with the milk mixture. The number of layers will vary depending on the shape of your dish. Cover with foil and cook for 30 minutes. Remove foil and cook for an additional 30-35 minutes or until potatoes are fork-tender and just starting to turn golden brown. Top with shredded cheese and cook for an additional 10 minutes or until cheese browns and mixture is bubbling. Remove to a wire rack to cool for a few minutes before serving. 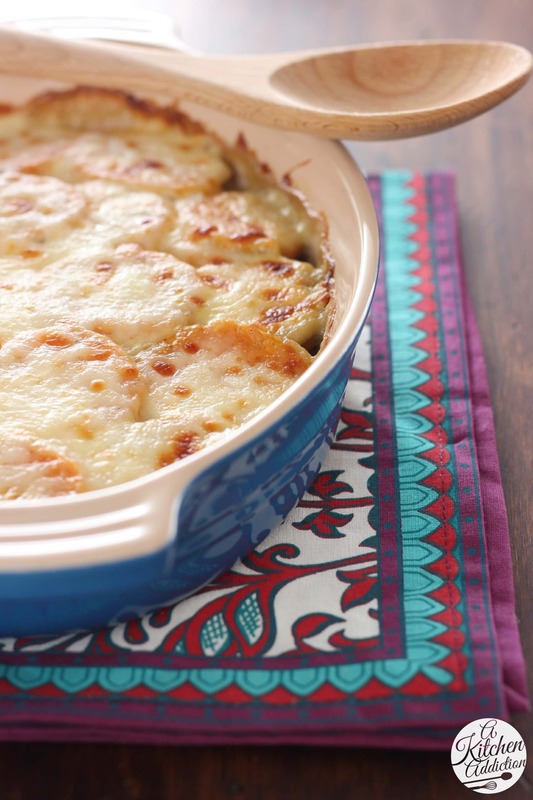 I love the idea of using sweet potatoes for scalloped potatoes!Looks delicious, too! I’ve never had scalloped sweet potatoes before, but you can be sure I’m going to try them! I love that you used sweet potatoes. This is a gorgeous dish for Thanksgiving. Sorry to hear that y’all have been sick. This casserole would definitely cheer me up. These look SO dang good! Love all of it’s cheesy goodness! And I hope you feel better soon! I’m a fan of “cheesy” anything! This looks amazing!!! 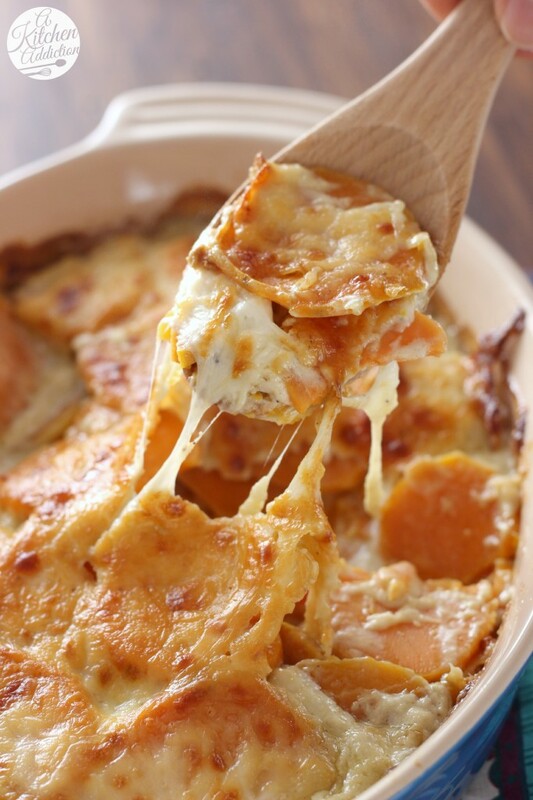 I have always loved scalloped potatoes and never once thought to use sweet potatoes. What a great idea! I love potato dishes like this! OK, I am in trouble. . my menu is pretty much set but today I’m finding so many other awesome recipes, like this one. . so now I don’t know what to do!! These cheesy scalloped sweet potatoes (I love that you used sweet potatoes) will be on my table. . or at least a version of this fabulous dish!!! love love love! and I hope you guys are feeling better! no one wants to be sick over the holidays! SO MUCH CHEESE. I love it! Oh man those are looking so good right now! Oh man, this looks amazing! I can never ever turn down sweet potatoes and with all that cheese?? Yum! I love sweet potatoes, especially in savory dishes. That cheese on top looks amazing! This looks delicious! I hope you feel better in time for the big day! I love that you used sweet potatoes! This looks amazing! Hope you guys feel better soon! What a beautiful, simple way to make the sweet potatoes. I will definitely be trying this! Ugh, I hope you’re both feeling better soon. I just tried a mixture of regular and sweet potatoes in scalloped potatoes this week so I can imagine exactly how delicious this is! What a fun way to do sweet potatoes! These look awesome!